If you're here and you are reading this you must be a nail art lover/adicted and you definetly want pretty nails or something that will stand out anyway. Well let me tell you the must have thing-y for this: the acrylic colors. As most of you probably know you can't really do nail art with regular nail polish - it's to thick or hard to use in tiny details. So when I was contacted by Born Pretty Store to do a review of a product I knew right away what to choose. 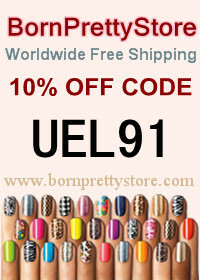 If you haven't heard of this store before you definetly have to check out the link above and see all the nail art items and cosmetics they provide at fair prices and free shipping wordwide - cool huh? Now, let's get back to my nails. At the beginning I had no idea how they would turn out but I can declare myself satisfied by the result. Of course there is always room for practice but I've got nothing but time (theoretically^^) I've started with a white base then sponged a bit of yellow and light orange together and at last I free-handed those flowers. Since this is my very first acrylic colour set I can't really make comparisons with other brands. What I can say is that all the colors are very pigmented and that is an important aspect with this type of paint because from the first line you draw you have a full coverage and you rarely have to insist on it. Each tube has 12ml and believe me that is more than enough because you use very little when painting your nails. 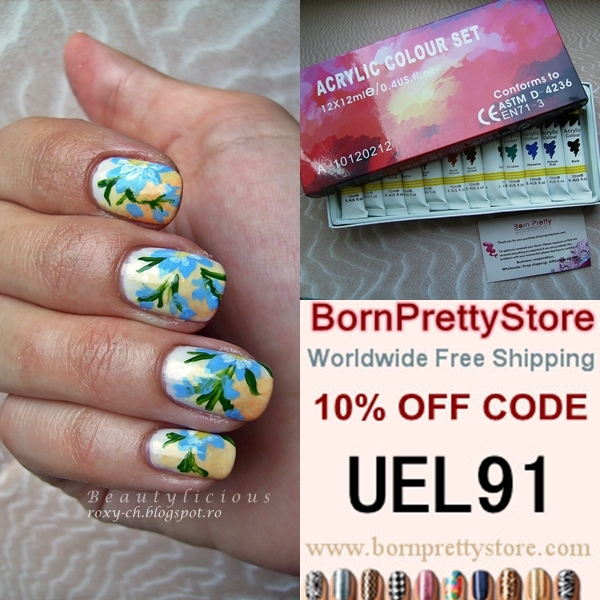 So if you're in need of such colors you can find them >here< and if you use the code "UEL91" you get a 10% off on your whole order. Vai,cat de bine arata manichiura!!!!! Doamne, deci este minunata manichiura ta! wow this is stunning, beautiful colours. I might get those acrylic paints now. Cat de minunata este manichiura. Bravooooo! Pupic. Adorabila! Imi place fff mult. Oh waw, I love how that came out, so pretty!